How much does it cost to travel to Stratford-upon-Avon? How much money will you need in Stratford-upon-Avon? £111 ($145) is the average daily price for traveling in Stratford-upon-Avon. The average price of food for one day is £31 ($40). The average price of a hotel for a couple is £132 ($171). Additional pricing is in the table below. These average travel prices have been collected from other travelers to help you plan your own travel budget. How much money do I need for Stratford-upon-Avon? Stratford-upon-Avon is a historic town in the English county of Warwickshire with a population of about 25,000. It sits on the River Avon and is famous as the home town of William Shakespeare. Today it is home to the Royal Shakespeare Company and a popular destination for those hoping to see a show. Much effort has been made to preserve the historical buildings that date back to Shakespeare's time and the city's quaint character and historic appeal make it one of the most popular tourist destinations in England. Every year thousands of visitors travel to the area to experience its interesting culture and history. The town has a temperate maritime climate that is common throughout the British Isles. Temperatures stay moderate throughout the year and rain is spread evenly year around. The average summer highs are around 22 degrees Celsius and the average winter lows are around freezing. The most obvious attraction in town is Shakespeare's Birthplace. It's located on Henley Street and is the most likely location of Shakespeare's birth as well as his home in the early years of his life. It has been restored in 16th century decor using many authentic items. 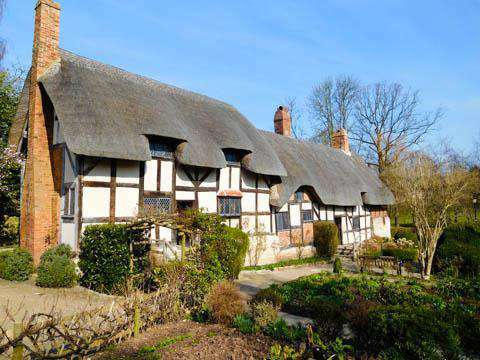 Other sights worth visiting in the area include Ann Hathaway's Cottage, Holy Trinity Church, where Shakespeare is buried, the Royal Shakespeare Theatre, the Wyrd Museum and Henley Street Theatre, and the Stratford Butterfly Farm. The Falstaff Experience is the largest museum in town and offers ghost tours of this famous haunted building in the evenings. There are several streets of interest for tourists. Henley Street is one of the oldest streets in the city and where you will find the birthplace of William Shakespeare. Sheep Street runs from Ely Street to the Waterside and was a residential quarter in the 16th century. Waterside and Southern Land is between the foot of Bridge Street and the Holy Trinity Church. It follows the River Avon and is where you will find the Waterside Theatre. There are many relaxing activities that you can enjoy while you're in town. Many visitors like to hire a row boat and take a trip along the river. There's also the Royal Shakespeare Theatre, which is an excellent place to watch a show, although tickets sell out quickly. If you're traveling with children, then you can check out plays that are put on by The Royal Shakespeare Company in the courtyard theatre. They are kid friendly with no swearing or adult content. Another interesting place to visit is Tudor World. It is set in a Tudor Building and lets you see what Tudor England was really like. There are many different walking tours around town as well. The Stratford Town Walk is a daily guided tour that offers a great introduction to the town. The walk starts on Waterside by the Swan Fountain and lasts for a couple of hours. Other interesting tours of the town include the Terrifying Tales with the Master of the Macabre and the Stratford Town Ghost Walk. Food options in town range from local cuisine to international. You can find Thai, Italian, sandwiches and tapas. If you're on a tight budget then there is a fish and ship shop across the street from the RSC, by the river. The Black Swan is also a favorite pub for visitors to the area. If you want a local restaurant that is popular with the locals then check out Vintneron Sheep Street. It's more expensive, but of very high quality. The town is small and compact, making it an easy place to explore on foot. You can easily walk to most of the main sights and attractions. There are also daily walking tours of the town that go by the major attractions of the area, including Holy Trinity Church. These walks, called the "Stratford Town Walk", offer a great overview of the town. If you're not interested in walking, there are also open top bus tours that go by most of the main attractions and the town center. The tours also take you out of town so that you can see the local countryside as well as Anne Hathaway's Cottage in Shottery and Mary Arden's House in Wilmcote. Cycling is also a great way to see the area. There are many cycle paths around town and through the countryside. The Stratford Greenway is about 5 miles of trail at the edge of town. It used to be part of the rail network until the 1960s and it has now been converted into part of the Sustrans National Cycle Network. If you don't have your own bike, you can rent one from Stratford Bike Hire on Seven Meadows Road. Although this town centers around the birth and life of Shakespeare, it is pleasant and scenic enough on its own to just stroll through and admire the surroundings. In the town you can visit the house that the Bard was born in (and grew up in, and then later lived in with his wife). You can also visit Anne Hathaway's house (his wife), the Nash house, and several others. The Holy Trinity Church where Shakespeare is buried is also open for visitors. There are also various theaters in the town to explore such as the Royal Shakespeare Theatre (get tickets well in advance) and others not related to Shakespeare himself but still part of the town's attractions.